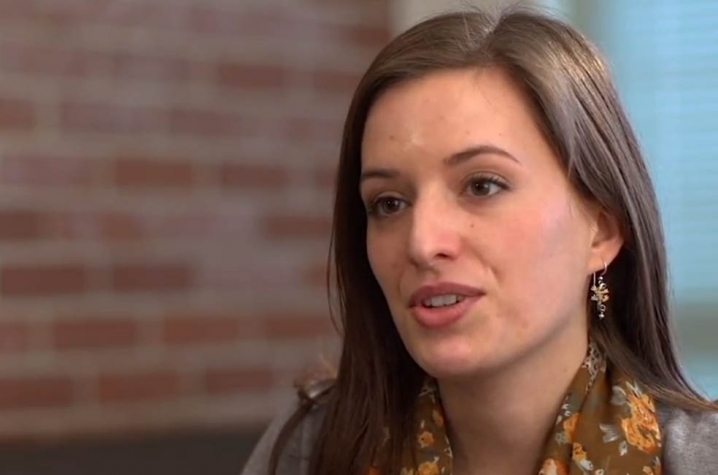 LEXINGTON, Ky. (April 29, 2013) — Schyler Nunziata is a first-year Ph.D. student in biology at the University of Kentucky, and she’s the first success story highlighted in a new video series. Nunziata is a young scientist who can testify to the impact of Kentucky's Experimental Program to Stimulate Competitive Research, known as Kentucky EPSCoR. Two grants from the National Science Foundation through EPSCoR kept Nunziata in science and in Kentucky. The first $5,000 grant, while she was a masters student at Eastern Kentucky University, funded her entire thesis project, which involved collecting two lined salamanders, developing genetic markers, and genotyping the salamanders. The second grant, as a Ph.D. student at the University of Kentucky, allowed her to prepare a pilot study. "EPSCoR helps get students into research, and helps develop them as scientists. For me, it allowed me to delve deeper into a field that I was interested in and find out what research was like and what a career in research would entail. EPSCoR has had a huge impact on my career path," said Nunziata. Kentucky EPSCoR exists to advance the Commonwealth’s research and development capacity for innovation, discovery and knowledge-based prosperity. Kentucky EPSCoR has been the channel for over $430 million in research funding to the Commonwealth's academic institutions. Over 80 percent of this funding has been competitively won from federal research programs. In addition to supporting 1,400 research jobs and providing research training for over 2,300 students, this funding has created 21 research centers and major research initiatives on Kentucky's campuses. For more, visit http://kyepscor.org and http://www.kynsfepscor.org. A series of videos on Kentucky EPSCoR will be produced by the Reveal: Research Media team, through the UK Vice President for Research. For more, visit http://www.research.uky.edu/reveal.